The number of Americans taking prescription medicine is rapidly growing. It has increase so much recently that an entire campaign was created to bring awareness about the dangers of mixing medications and also mixing certain foods with medications. This week is “Take Your Medicine, Americans, Week,” and it’s never been more relevant. Over the last decade, the number of Americans taking multiple prescription drugs has steadily increased. At the moment, almost half of all Americans take at least one prescription drug a month, and over 30% use two or more. But many people have a hard time incorporating medicines into their daily routine. With many medications the result of such an oversight can be detrimental. Know what you’re taking … The first and most important step toward good recovery is knowledge! Know what you’re taking – by name. Knowing the name of your medication will allow you to talk to your medical professionals about possible side effects, negative interactions and much more. If you habitually take more than one medication or find the name is too long and hard to pronounce, which I know they can be, make a list to carry around with you or take a picture of the bottle with your smart phone. At VH Pharmacy, we can even refill your prescription if you send us a photo of the bottle with our mobile app. So get those cameras focused! Know how to take it … Knowing how to take medication is also very important. I’m sure we’re all guilty of taking a medication on an empty stomach that should really be taken with food. It’s not just about suffering the wrath of our stomachs. Medications work best when taken as directed. Know how often to take it … Medications also work best when taken at the appropriate times. To plan a dosing schedule that works for you, consider your schedule and make sure the medication prescribed is a good fit. For example, if your child’s pediatrician prescribes a medication that needs to be taken three times a day, know that one of those doses will fall within the school day. If you’d prefer not to depend on the school nurse, ask the doctor or pharmacist for an alternative. A compounding pharmacy like VH may also be able to customize medications with dosing schedules that are a better fit for your lifestyle. Know about drug interactions … If you fill all your prescriptions at the same pharmacy, your pharmacist will check for drug interactions each time you have a new prescription filled. However, he has no way of knowing whether you use over-the-counter drugs, herbal supplements or homeopathic medicines. All of those could also cause drug interactions. Know how long to take it …This will vary depending on your condition. If you have a bacterial infection, you may need a 10-day supply of antibiotics. If you have high blood pressure, you might need treatment indefinitely. The most important thing to remember is to finish the course of treatment! The introduction of new drugs and multitasking of old drugs has lead to an increase of improved health and quality of life. But it’s important to be educated and aware about all substances that go into the body. That is the best way for you to get full benefit from your medications. 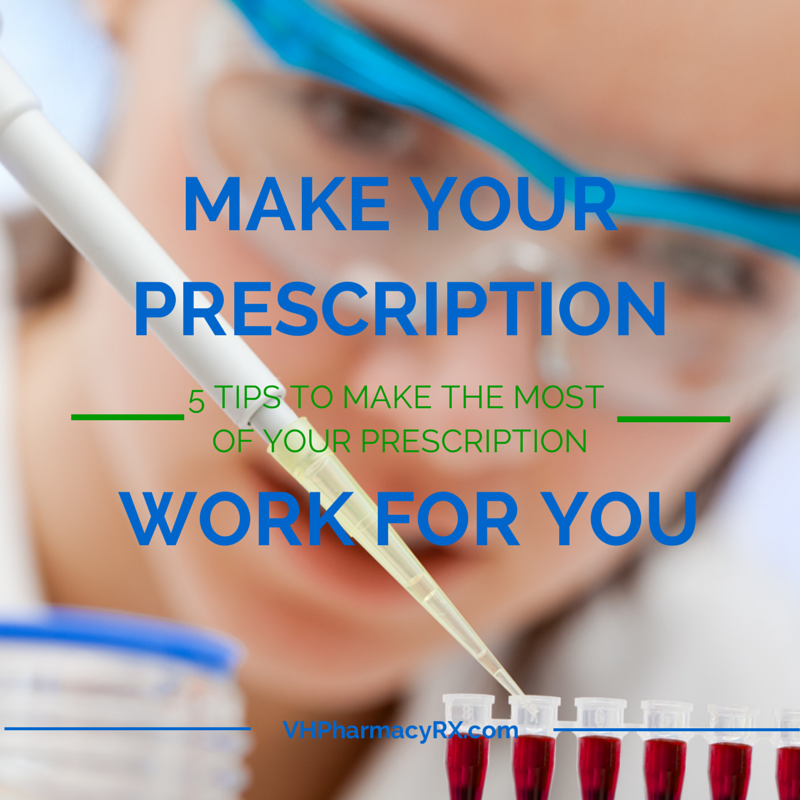 At VH Pharmacy, we like to work one-on-one with our customers to be sure they get the most benefit from their prescription medications. We hope you will come talk with us soon.